This savoury form of bread and butter pudding is mostly adapted from this recipe found at Taste.com and it is a hit in our corn-loving family. Everything in this bread and butter pudding is in such a great balance. Taste-wise, it is cheesy and fantastic with no eggy taste at all. Texture-wise, the pudding is smooth, moist and not soaking wet at all. "Mummy, we love your cooking! ... especially this one." - Hearing this makes me smile. 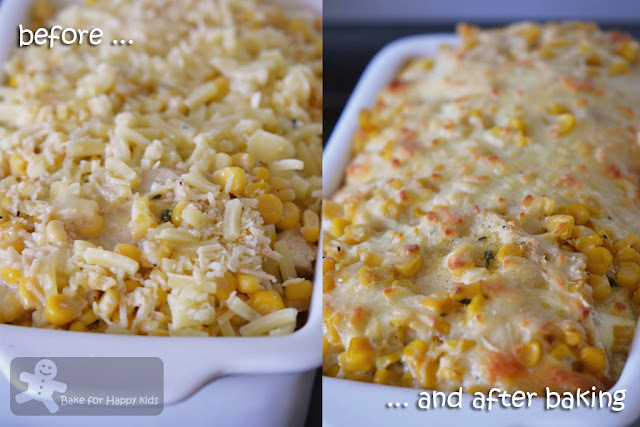 No doubt at all that there is lots of thumbs up for this nice and easy corn dish. 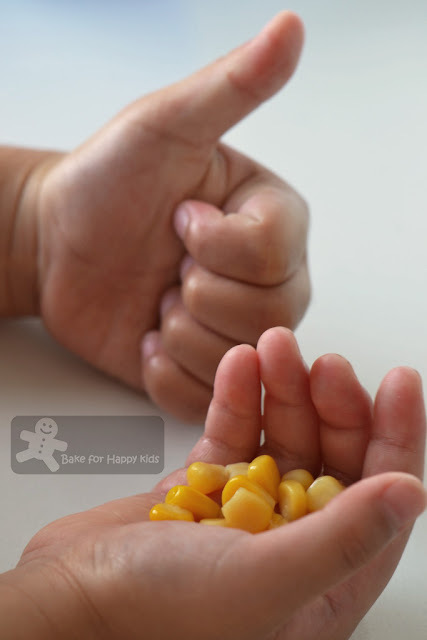 Thumb up for corn! ... and corn bread and butter pudding! Place the milk in a saucepan with bay leaf and clove over medium heat until just scalding. Remove from the heat and set aside for 15 mins to infuse. Preheat the oven to 190°C (or 170°C fan forced). Grease a 2-litre ovenproof dish. Melt the butter in a medium frying pan over low heat. Add garlic and cook for about 2-3 mins or until fragrant. Add corns and thyme and season with salt and pepper. Place a layer of bread slices on the base of the dish, cover with a layer of corn mixture and then the cheeses. Repeat to make another layer. 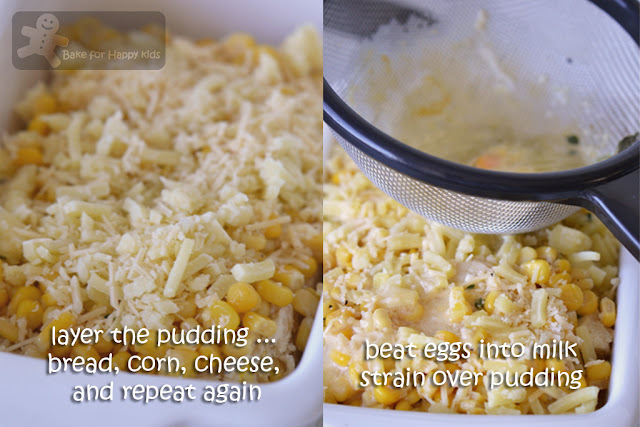 Beat eggs into milk, then strain over the pudding. Allow to stand for 10 mins before baking in the oven for 35 mins or until crisp and golden. Serve this and ready to be complimented by corn lovers. Hi Zoe! I always make this dish with croissant... corn bread sounds like an interesting substitute! Nothing beats the little ones' comments and thumbs up! Well done! What a great idea - I had never thought of savoury pudding before. Great dish of gooey goodness - cheesy too! 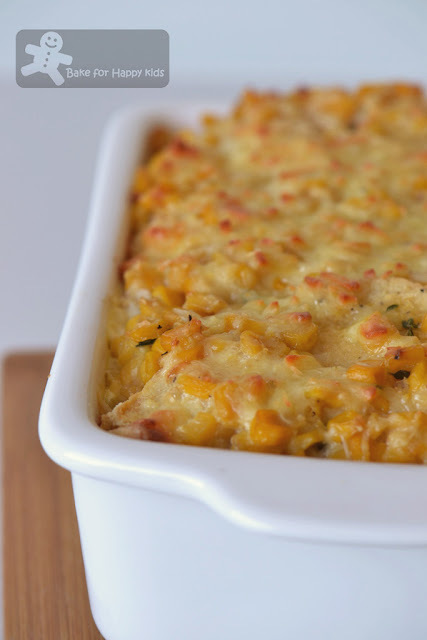 I can see why this corn pudding would be a hit at your house. This looks delicious. What a great savory pudding!! Who wouldn't love this!!! Ooh, how tasty! An obvious hit! This definitely gets a Big thumbs up from me too!!! Love the savoury twist to the bread and butter pudding!! Hi Zoe, thank u for visiting my space.so happy to follow ur space .......u have an amazing blog ...keep going,good wishes !! 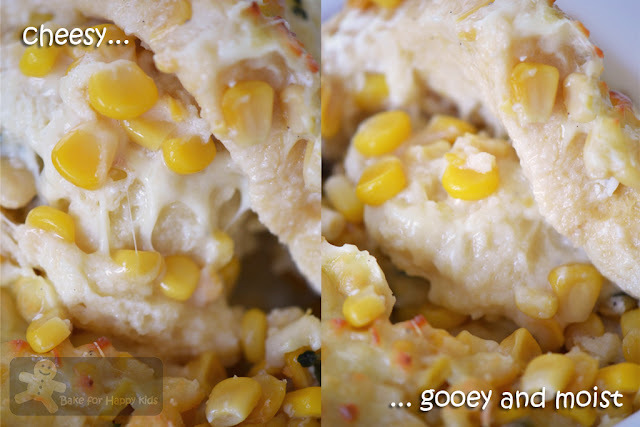 wow...this is savory, with lot of cheese and sweet corn, must be yummy! So interesting this corn dish...looks delicious, I love the creaminess of it. Hope you are having a wonderful week Zoe! Bread n butter pudding is delish..with corn in it, is a bonus! Must make this - one of these days. Thumbs up once again Zoe!! Zoe, I am not a fan of bread puddings but this one sure looks good! Love the golden corn kernels in the pudding. First time I'm hearing of corn bread pudding. But it sure looks delicious with all that cheese and the corn. Corn and cheese goes well together for some reason. Never actually had a savoury version of this kind of pudding but yours looks really good! First time seeing corn bread and butter pudding. Sounds interesting! That looks yummy! My boy actually likes bread pudding but I don't have much leftover bread to bake this lol! Like your hubby and son, I am not a fan of bread pudding too! I never like anything soggy! Your version with lots of corn on top does look good, at least there's some crunch in each bite! 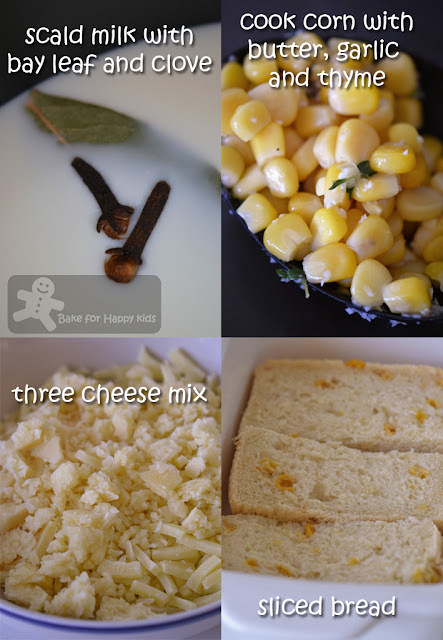 hey Zoe, thanks for invited me to Little Tumbs up, really love it and added my corn puddings. I love your corn and bread and butter pudding! look georgeous!! this sounds like a comforting bread pudding dish to me ! must have smelt so good too! How did you find those corn recipes? Everything look great and my thumbs are up for all! I love the sound of a savoury bread and butter pudding, this looks so delicious! Wow Zoe, this is an amazing recipe! but it sounds very tasty. Zoe, you are always giving 100% effort in cooking/baking! It's a bit difficult when you love in eating something but you are the only one who likes it in the family. I also find the same problem too! Your savoury bread & butter pudding looks so delicious there! Good to make for winter! That is really yummy corn pudding, Sure I will try this. It's great that it has no eggy taste, that can definitely be a turn off. although I dun quite like bread pudding but I must admit this looks delicious. I've never seen this version before but it sure does look good. Bread pudding is my family favourite n plus corn will make them go gaga ...ha ha ha. Thanks for the recipe. Will definitely make it for my family. Just love reading your blog with so much informations from you. God bless you. Gorgeous looking bread pudding, very interesting recipe. Good job! If you love Bread and Butter pudding, I just posted my recipe on my blog. Can't wait to try this one though. I've never had a savory bread pudding before. What a brilliant idea.